This page shows the standard features for your chosen pet door. To customize your order, fill in all options below and click the Proceed button. Note that the Proceed button is disabled until options are added or changed. Please pick the appropriate size pet door for your pet. The Wall Model is available in 11 standard sizes or we can make you a custom size door. Please see our sizes page for more information if you need help in choosing the proper size. Please choose a size from the drop down box. The dimensions listed next to each size are for the passage opening the pet would use. For rough opening and tip to tip frame dimensions, see our sizes page. If you need a custom size door, please see our custom models information page. NOTE: picture shows door models. Pick the number of flaps you would like on your wall model. Standard is double flap. Our Wall Model comes standard with double flaps for improved insulation and energy efficiency. In some situations (i.e. installing in an interior wall) you may choose to install a single flap model. 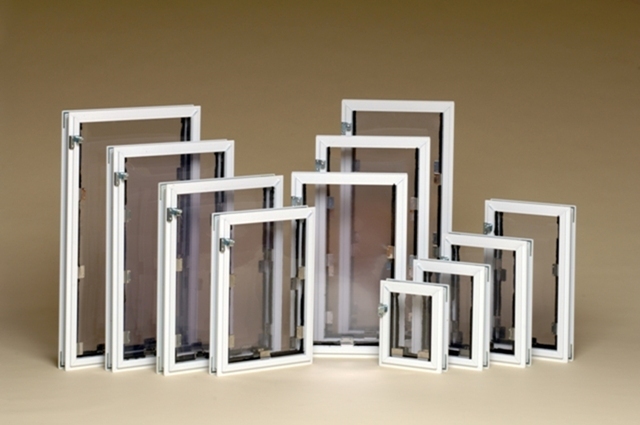 If you do choose a single flap, it will be installed on the exterior frame of your pet door. Pick one frame color for your pet door or pick mixed so you can get a different color for the inside and the outside. Click "details" for a picture of the colors. 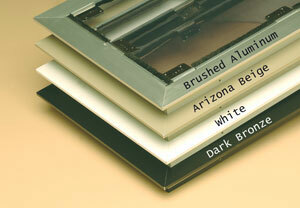 Pick the color of frame you would like on the inside of your house. Pick the color of frame you would like on the outside of your house. Top load is standard or pick a left or right side load direction. See "details" for a photo of side vs. top load covers. Choose this option if you would like a second cover on the exterior of your pet door. This cover does not come with a pinlock unless purchased separately. NOTE: Choosing this option makes your pet door a "custom" door for return policy purposes and entitles you to 50% credit towards the purchase of a new door should you need to return your door for any reason. Occasionally, our customers have also requested an additional exterior cover be added to the standard wall model. This option is also available. This is generally used if you need to be able to lock the pet door from the outside without access to the house (i.e. a worker comes into your yard and needs to temporarily lock the pet inside) or to prevent a pet from chewing on the flaps while locked out or to prevent a pet from running into the interior cover if you have them temporarily locked out. This cover does not generally come with the pinlock closure so it is not considered additional "security." Standard is top load. If you use a raincap, you must choose a side load. Direction is determined by "outside looking in". The Standard tunnel works for most walls. Our Wall Model comes with a standard 10" tunnel to fit walls between 2" and 10" in size. We offer an optional oversize 16" tunnel for deeper walls. If you need a tunnel longer than 16", please see our custom models information page. If you do not order a training flap with your initial door order but find that you need one at a later date, you can order them by visiting our replacement parts page. Please add 5% to the cost of the door for training flaps.